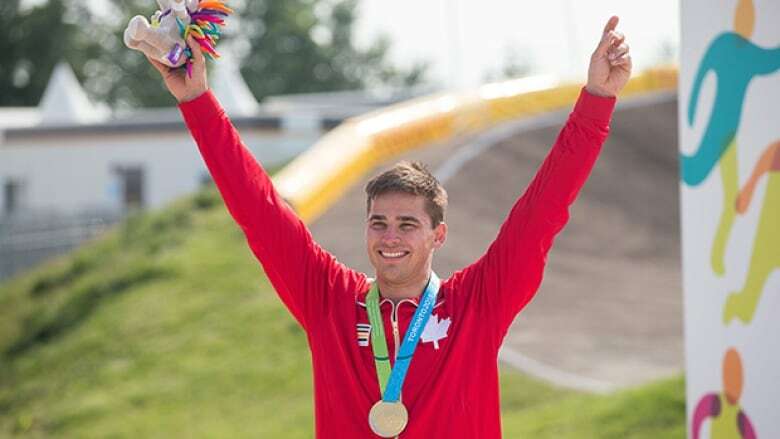 Canada's Tory Nyhaug claimed the host nation's fourth gold medal of the opening day of the Pan Am Games by racing to victory in the men's BMX final. Canadian cyclist Tory Nyhaug won gold in the men's BMX competition on Saturday at the Pan American Games. Nyhaug finished first in 36.208 seconds at Centennial Park Pan Am BMX Centre. Alfredo Campo Vintimilla of Ecuador took the silver in 36.501 and American Nicholas Long won bronze in 37.046. Carlos Alberto Ramirez Yepes of Colombia was the unofficial third-place finisher but was later relegated to last place for an on-track violation. Nyhaug took advantage of his inside start position to jump out to an early lead as the lively crowd cheered him on. He used his explosiveness to propel himself over the jumps and rollers on the track and worked the turns nicely ahead of the run to the finish. The 23-year-old from Coquitlam, B.C., kept up the pace in the final seconds for the victory. "That's as perfect a day as you can get in a BMX race," Nyhaug said. "I knew the final was going to be a battle. I knew all week that I could do it. To come out on top is unbelievable." Earlier in the afternoon, Nyhaug was in complete control over the three quarter-final runs on a hot, sunny day on the west-end Toronto track. He jumped out to a comfortable lead in each heat and had time to let up at the finish. He was just as strong in the semifinal and kept the pace high in the eight-man final. Nyhaug made his Olympic debut in 2012 and won silver at the world championships last year. "This is the highlight of my career, no doubt," he said. "This is the first big win I've had. To finally come through and win a race like this — and in front of a home crowd — is an experience I'll never forget." International Olympic Committee president Thomas Bach and Canadian Olympic Committee president Marcel Aubut were in attendance for the finals. Nyhaug's performance was dominant from start to finish. It was the complete opposite for Canadian teammate James Brown. Brown, from Airdrie, finished third in his opening heat but was relegated to last place after his tire touched the grass outside the track line. His back tire blew in the second heat. Still needing to physically cross the line, Brown made the long, slow walk with his bike along the track. He raised his arm to acknowledge the applause from the crowd as the funk classic "I Feel Good" played on the loudspeakers. "I didn't feel too good," Brown said with a chuckle. Nyhaug, who has battled injuries throughout his career, suffered a broken foot late last year and only resumed riding last April. In the women's final, American Felicia Stancil took the gold in 41.647. Ecuador's Domenica Azuero Gonzalez won silver in 41.948 and Mariana Diaz of Argentina took bronze in 42.611. Daina Tuchscherer of Airdrie, Alta., and Amelia Walsh of Ayr, Ont., did not make the eight-rider final.